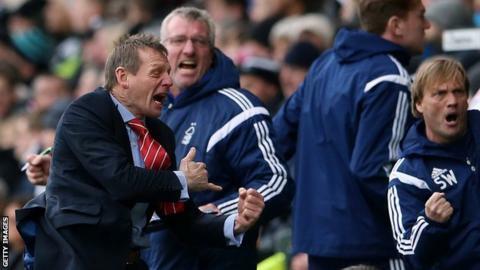 Nottingham Forest manager Stuart Pearce says his players have "set the bar for themselves" after Saturday's 2-1 win at East Midlands rivals Derby. The pressure had been growing on Pearce before the game after a run of two wins from 20 and a slide from top to 12th in the Championship. "That's been coming - hopefully it's a catalyst to push us on," said Pearce. "I asked the players to put a marker down that the supporters would be proud of, and I think they did that." He continued to BBC Radio Nottingham: "It's a great result for us against a Derby side who will be close to promotion this year. We need to make sure we are ready for Wednesday night against Fulham and back this up." Forest's form - in contrast with third-placed Derby's push for automatic promotion - had drawn strong criticism from former England defender Danny Mills, who played under Pearce at Manchester City. "He is not a great coach, he's not a great tactician, he's not a great motivator and he struggles with big players who question his authority." But after Ben Osborn's last-minute winner at Derby, Pearce said he was unfazed by any talk of pressure from outside the club. "I know Danny very well, I worked with him at Man City and put Micah Richards and Nedum Onuoha in front of him," he said. "Danny gets paid to make observations on football and I'll accept anything he's got to say. I've no idea what he said but it's fair say say it probably isn't complimentary about me as a manager. "It's neither here nor there. My respect goes to people like Steve McClaren, Tony Pulis, Harry Redknapp - people who have spent hundreds of thousands of games in the technical area - that's where my real respect goes in football."